See More Long Range Wireless Camera Kits Here Four (4) Wireless CMOS Camera Kit with Remote Control Wireless Receiver - 300 meter Range. Open transmission distance of 300M. 2.4GHz locked frequency transmitter and receiver. 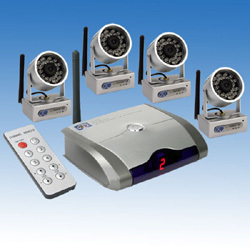 The four CMOS cameras have an internal microphone and night vision distance of 10-15M, the receiver has a remote control unit and can output two lines of audio and video signal synchronously, can be connected to a TV, monitor or LCD TV for image/audio monitoring, also incorporates a delay timer to switch automatically between camera channels. This wireless camera kit is ideal for use as a CCTV system for monitoring activity in warehouses, offices and children's play areas because of the long 300M transmission distance you can place your cameras further away from the receiver.